The Rotterdam Convention Secretariat joined forces with the FAO Pesticide Management Team as well as international partners in holding a strategic planning workshop for members of the Southern African Pesticide Regulators’ Forum (SAPReF) in Harare from 27 – 30 July. The objective of the workshop was to come up with a strategic action plan to reduce health and environmental risks associated with the use, trade and disposal of pesticides. Established in 2011, the SAPReF is a group of pesticide regulators from Southern Africa Development Community (SADC) member countries who are working together on matters related to pests and pesticide management. The major challenge so far has been the lack of an agreed plan of action towards reducing the risks posed by pesticides and how to strengthen their regulation and management. 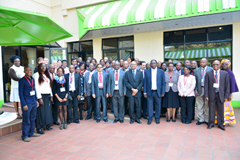 The meeting saw 52 participants from 14 (out of 15 SADC) countries, representing Ministries of Agriculture, Environment and Health including five Designated National Authorities (DNAs) to the Rotterdam Convention, as well as partners including the Africa Institute, Africa Union (AU), the Common Market for Eastern and Southern Africa (COMESA), FAO regional and country offices, the Inter-Africa Phytosanitary Council (IAPSC), Kemikalieninspektionen Swedish Chemicals Agency (KEMI), Southern African Development Community (SADC), University of Cape Town (UCT), and the World Health Organisation (WHO). The meeting strengthened regional cooperation and communication among participants and raised awareness of the Rotterdam Convention in the region. It provided parties with technical assistance to follow up on their obligations under the Convention and facilitated the mainstreaming of the Convention work into national activities on pesticide risk reduction. Participants were extremely motivated and included the implementation of the Rotterdam Convention as a priority in the SAPReF Action Plan for 2015-2016. Apart from setting long term goals, concrete results were also achieved during and shortly after the workshop. The hands on training on import responses yielded success and several countries already submitted missing import responses. “After the workshop we are following-up with countries in particular to assist them with their obligations and also for them to make best use of their opportunities, such as the possibility to signal specific pesticide formulations that may be causing problems. We expect more import responses, notifications and even an SHPF proposal to be submitted as a result of the workshop ”, Christine Fuell said. All but two countries are already parties to all three Conventions and information regarding the ratification of the Conventions was provided to the non-Parties.